Thanks Jeanette, that is most helpful and good to know. About dates, I have been using my Britannica encp. for a few years to get dates. His is the first time it has failed to give one which after being in power for 40 years I would have thought they would have printed if it was reliable. which brings me back to my origional thinking, that a small group, living in tents with their flocks in 1942, just would not have been concerned with dates ! i would have thought avoiding landmines, tanks, hungry soldiers looking for fresh meat....... What the date was ? who would care. Dear Manfred, thanks for mentioning the forum. Thanks Manfred for your further research on specific person. Is the luck line also called the fate line? Can these two separate observations about the life line and the luck line be combined to yield an age estimate? It would appear to be a great opportunity for calibrating the passage of time from the palm. Mr. Amin, what do you think? 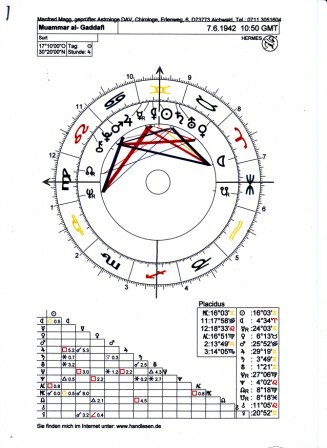 here is Muammar al-Gaddafi's birth chart. - The time is unknown and I'm not really shure if the date we find by wikipedia is really right. Mention the important Saturn / Uranus / Sun conjunction = permanent revolution against restrictions and traditions. Mention the aggressive and revolutionary Uranus / Mars Transit conjunction with his birth Moon and the Pluto Transit Trigon to his birth Moon (the exact ° are unshure because of the unknown time) = fundamental, transforming changes of the folk with a more positive result at the end. I think I have sent you a reply and I think this will pop up in the list thing bit ?! You sure get a lot of options to type stuff in on this site. However, Qaddafi knew this was coming and he knew a strong army was a bigger threat to him than anyone else which is why he kept his army weak. His son’s speech was spot on when he say Libya is still just a collection of tribes and city states, which is the norm from a historical prospective for that region. 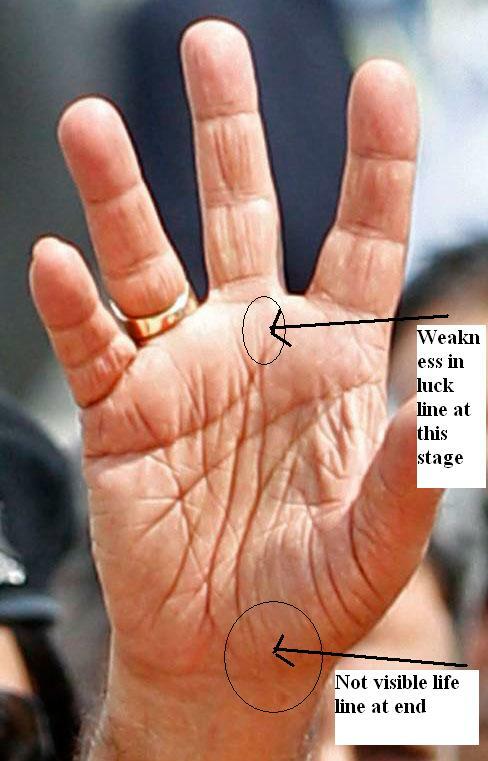 His life line as shown in the last photo make me think he will come out on top after this is all over. The split at the end is strong and then gets weaker. So I would say the country will split or some federal type arrangement will be put in place. His hand does not seem to show him being toppled by force. Rattled for sure, but not finished. Also I am in agreement with Manfred about the astrology. I was looking at it earlier in the year in concern with Egypt and the date of the rebel uprising could not be worse from the point of view of Mars and Venus. I would like to add that Neptune is the planet which I spotted to be in play with all this north African stuff. If you just take the transpersonal planets for 1942, and key points in Egypt, then consider Neptune’s influence in oil and religion. 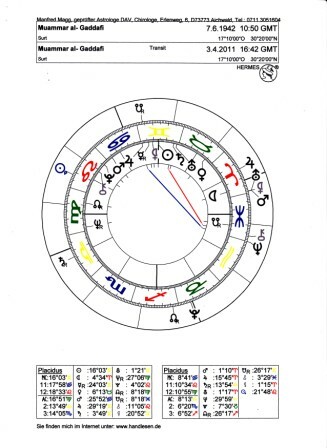 Its connection with Uranus and that they both changes signs within weeks of each other. I would say the long term effects will be bad for the west and good for Islam. In short oil will never be below $90 a barrel again. If we take AC 1° Leo (7:15-7:30 GMT), we come to interesting constellations: Pluto/Mars conj. Leo AC, MC in Aries. And even the transit of these days are interesting with this. - Perhaps with more time I'll verify the congruent time (7:15 GMT) on base of some biographic events. "Jupiter square to the moon causes him to overreact to situations - his judgment is affected" - I would bring it together with a leaning to exaggeration and to don't accept his limitations. I've just listend to the news on the radio. They say that Gaddafi is probably escaping in a car convoy to the neighbour country Niger. "Müsste ich eine Prognose hinsichtlich seines fortschreitenden Alters stellen, hielte ich ein gewaltsames Ende für ebenso unwahrscheinlich, wie ein Verlassen des Landes oder eines Gehens ins Exil weiter entfernt von seiner Heimat. Hier würde ich eher ein sich Zurückziehen in ein einschränkendes Refugiums innerhalb des Landes oder eines sehr nahen Nachbarlandes als passend mir vorstellen. Schwierige Jahre würde ich für seine Mittsiebziger erwarten. Stimmt das überall angebene Geburtsjahr tatsächlich, wäre das noch einige Jahre hin." "...I don't believe in a (his) violent end....I would think, that a withdraw in a restrictive refuge within his country or in country very near by would fit. I would await, that his midseventies (considering on his health or live) are difficulty years." Thanks Patty. - My wife took the foto on our long trip through Australia in Bowen / Queensland. 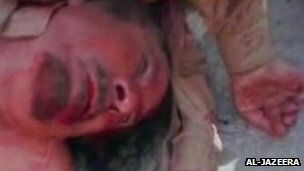 Muammar Gaddafi has been killed in Libya on 20th Oct 2011. He enjoyed 42 years of his tenure in Power. It's a second fate line. It can, but not necessarily, it can mean dual personality or any other duality. A deep enemy line forming a star with head line at the place of resistance Mars shows firing excitements experiences and disturbed mentality at the age. Thumb shows he was not much tactful. He was stubborn and driving force was ending and hence sudden death. Had it been independent on the palm; it would had been for illumination. However deep uninterrupted direction lines reveal his supply did not stop throughout his life span. He had abundance of everything in his life. But, a true Apollo line can start from any place on the palm but must lead or direct the course or seems to end at under the ring finger. That was not the case with Gaddafi. Gaddafi had a feeling in his bones perhaps knew this very well that his end was fast approaching to him. Termination of success line is very important. A very strong Apollo line is terminating at the mount of Saturn under the middle finger on his palm of the hand. The sunny bright confident approaches to rich life will turn in to sad event and hence he was destined, qualified or entitled to a serious, gloomy dingy end of life. As Mark Twain said “The offspring of unethical riches are pride, vanity, ostentation, arrogance ruthless and tyranny.” We receive what we give to others. Same happened with him. In general practice If an Apollo Line starts under the Apollo finger proceeds further, but, takes the direction to the Mount of Saturn, this will make the subject’s artistic sunny taste will take a gloomy turn or look and can make the subject more serious fearful in outlook and behavior.